Two parents share the extraordinary and inspirational story of how they sent six of their ten children to college by the age of twelve—and how any parent can achieve the same amazing success. 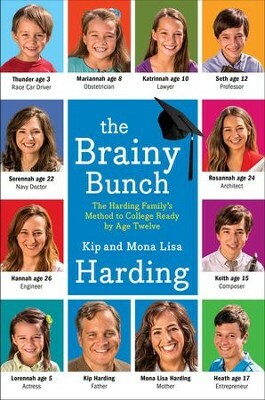 If the Harding family can do it, your family can too! Having six out of ten kids go to college is no small feat on its own, but having six kids in college by the age of twelve— that’s nothing short of incredible. Meet Kip and Mona Lisa Harding, high school sweethearts whose simple homeschooling method produced exactly those extraordinary results. Kip and Mona Lisa are parents to an engineer (who earned her BS in mathematics at 17), an architect (who finished her five-year program at 18 and became the youngest member of the American Institute of Architects), a Navy physician (who earned her biology degree at 17), an entrepreneur (who earned a BA in English at 15 and an MS in computer science at 17), a 15-year-old college senior studying music theory and performance, a 12-year-old Middle Ages scholar with the highest average in his college class, and four others who are following fast in their siblings’ footsteps! No wonder the family is so used to being asked: How did you do it? The Hardings are the first to say they’re not geniuses. Nor do they run a strict, high-pressure household. Instead, they find out early what really motivates their children, instill their kids with dreams, and allow those dreams to blossom. In a remarkable, down-to-earth narrative that is part captivating memoir, part invaluable guidebook for parents, Kip and Mona Lisa reveal with warmth and humility the strategies behind their family’s amazing educational accomplishments. Filled with daily regimens, advice for providing children with fulfilling experiences that go beyond the home, and tips for making the transition to college, theirs is an inspirational real-life success story that anyone can achieve—whether you homeschool your children or not. 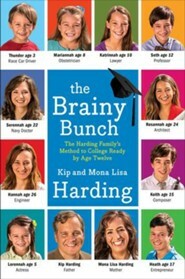 The Brainy Bunch is uplifting and ultimately relatable proof of what any family can accomplish through dedication, love, faith, and hard work. "Never judgmental and not without humor, the [Hardings] intersperse their story with strategies and advice...this fascinating read transcends the Christian homeschool market. Written in an engaging and relaxed style, the book tells how all 12 Hardings have accomplished much, and their account is inspirational and uplifting." "Motivated by their Christian faith and dissatisfaction with the lack of personal attention children receive in the classroom...the Hardings chose to homeschool their children -- all 10 of them. [T]he work ethic and family bonding are impressive, as are the children's career successes." "Through home schooling, the Hardings were able to attain [their] goals and much more, as evidenced by the success of their children...the methods defined here could work for others willing to buck convention." "[T]he Hardings' story is very much one of putting love and family first. They are not pushing their children to overachieve -- they are helping them to find their own unique potential." 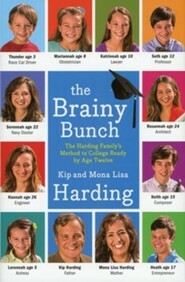 I'm the author/artist and I want to review The Brainy Bunch: The Harding Family's Method to College by Age Twelve - eBook.